International collaborators discovered two new structures formed by boron, which might have implications in hydrogen storage and other materials sciences challenges. Why It Matters: Understanding the structures and energy involved in building and breaking boron clusters could help design hydrogen storage devices. These devices are critical in developing cars and trucks that run on hydrogen, an alternative fuel that produces few pollutants. However, before hydrogen-powered vehicles can exist, materials that can store hydrogen and release it are needed. Boron could be a vital part of such a material. 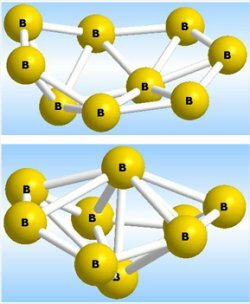 Methods: This work began more than 5 years ago when Dr. Lai-Sheng Wang at Washington State University and collaborators were working on the structures of boron clusters. The team led by Dr. Wang determined that the nine boron atoms form a flat wheel structure. But, the experimental data hinted subtly that there might be more structures. Calculations indicated the other structures were not feasible. Dr. Jun Li from EMSL along with Ms. Li-Li Pan of Tsinghua University and Dr. Lai-Sheng Wang, an Affiliate Senior Chief Scientist at PNNL and a professor at Washington State University, decided to see if there were other structures. The team began with the 2003 data. The data was from the photoelectron spectroscopy capabilities at the Department of Energy's EMSL, a national scientific user facility at PNNL. This data provided insights into the overall energy of the structure and how the electrons interact with each other. Then, the team performed complex molecular dynamics calculations, or Car-Parrinello calculations, on the 9-atom boron cluster. They ran the calculations on the supercomputer in EMSL. With the results of these calculations and advanced chemical theories, they found two new isomers: a convex quasiplanar structure and a distorted heptagonal bipyramid. Acknowledgments: China's National Key Basic Research Special Funds and National Natural Science Foundation of China and the U.S. National Science Foundation funded this research. The work was done by Li-Li Pan of Tsinghua University, Jun Li of Washington State University, and Lai-Sheng Wang of Washington State University and Pacific Northwest National Laboratory. Photoelectron spectroscopy instrumentation and the MPP2 supercomputer in the Department of Energy's EMSL were vital to conducting this work. Reference: Pan LL, J Li, and LS Wang. 2008. "Low-Lying Isomers of the B9 - Boron Cluster: The Planar Molecular Wheel Versus Three-Dimensional Structures." Journal of Chemical Physics 129(2):024302.